Gerlingen, a city with approximately 19.000 inhabitants, is located northwest of Stuttgart in the administrative district of Ludwigburg. Gerlingen nowadays is a wealthy and picturesque town, which benefits from viticulture and local industry. Companies such as automotive supplier Bosch have their head office here. The first documented record of Gerlingen is from 797. The city however only grew into a proper settlement after 1.200 years: in 1958, Gerlingen was given town privileges. After World War II, the population had increased massively and risen from 3.800 to 10.000 in only 15 years. These radical changes and the subsequent economic success was supported by the refugees and displaced people from eastern Europe, amongst them many Danube Swabians. Thus, for example, most of the displaced persons from Zsámbék (Hungary) found a new home in Gerlingen. For this reason, Gerlingen has close ties to Hungary. In 1969, the city assumed the sponsorship of the association of Germans of Hungary (regional association Baden-Württemberg). This entailed a promise to support inhabitants from Hungary in their cultural activities. Since 1976, hundreds of people from all over Germany come to Gerlingen every year to celebrate the National Ball of Swabians. Since 1987, the city is keeping a partnership with the Hungarian city of Tata. The relationship to Hungary also becomes evident in the person of Georg Brenner, Gerlingen’s mayor since 1999: he is chair of the German-Hungarian society, the aim of which is to maintain relations to Hungary and contribute to intercultural understanding. In Gerlingen’s city museum, one can observe that the Danube Swabians who arrived as strangers are now a natural part of society. In 1980, the historical school building was turned into a museum. 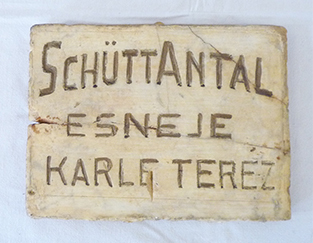 It displays a widespread collection on German settlement in Hungary, especially in the villages of Zsámbék and Harta. The museum of Germans of Hungary is incorporated into the city museum. Two recreated parlours with painted furniture lead the viewer into a rural life of the past. 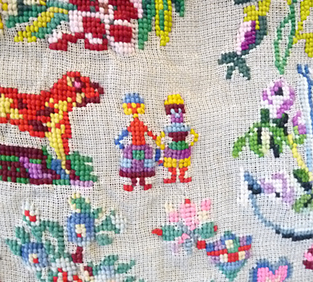 In several departments, items from agriculture, household and religious life are displayed and a large room is devoted to folklore costume and handicraft. 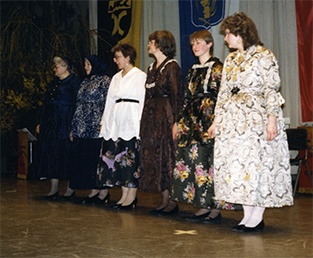 Folklore costume of Germans of Hungary at the National Ball of Swabians, 1988.